We’ve all heard about the film U-571. Or, more importantly, how its a travesty of a film. Supposedly a fictional film based on true events, it is nothing more than a plagiarism of heroism, twisted to maximise profits with scant regard for any kind of integrity. The men who were the REAL heroes were Able Seaman Colin Grazier, Lieutenant Tony Fasson and NAAFI Canteen Assistant Tommy Brown. Serving onboard the Destroyer HMS Petard, in October 1942 they volunteered to join a boarding party for the sinking U-559. Although the U-Boat was rapidly sinking, Grazier and Fasson went down below and retrieved vital documents, passing them up the conning tower to Brown. They remained below searching, and were onboard when the ship went down. Colin Grieve and Tony Fasson were both awarded a posthumous George Cross, and Tommy Brown the George Medal. The capture of vital Enigma code books enabled codebreakers at Bletchley Park to finally crack the Enigma riddle, and continue to read German communications until the end of the war. In particular, the capture helped the Allies to win the crucial Battle of the Atlantic. Without that victory, D-Day might not have been possible, and the war may have lasted much longer – raising the disturbing possibility of the Russians reaching the Rhine or the Channel. Yet surprisingly, it has taken decades for Grazier, Fasson and Brown to receive any recognition. The official secrets act precluded any publicity being given to the incident. The British Government were also keen to ensure that the Germans – and Russians – did not find out that the Enigma code had been broken. And thus the situation remained. Even the men onboard HMS Petard on that fateful night were not aware of how important Grive and Fasson’s actions were. Phil Shanahan, of the Tamworth Herald, has ensured that the mens names will be remembered for evermore. Starting with a chance discovery – that Grieve came from Tamworth, he was astounded that the winner of the George Cross was unknown in his home town. A series of articles in the Herald followed. A Committee was formed, and set about raising funds for a fitting tribute in Tamworth town centre. Along the way he had some interesting encounters, with the Producer of U-571, and the Imperial War Museum. The U-571 debacle in particular raised much publicity for the Colin Grive Project. As Shanahan states, not many English provincial journalists have been interviewed in a Dallas daily newspaper! There are some emotive episodes. In particular, I felt a personal connection with the dilemma Phil Shanahan found when confronting the Imperial War Museum. It is simply impossible to cover absolutely everything in any museum or book. The sad fact is that many people have their cause that is close to them, but there is never enough room to give each of them the credit that they deserve. It is a dilemma that many a poor Curator has faced, and I feel that the people who have to choose what to leave out deserve more sympathy. Similarly, it is easy to understand the sentiment that Grieve and Fasson should have been awarded the Victoria Cross. It’s something that I have written about at the time – that bravery is bravery, regardless of enemy action. Yet they were awarded the George Cross under the standards set, and it would have been unprecedented to upgrade them to the VC. This is a very interesting and rather unique book. It is, in many ways, two books in one – firstly the story of HMS Petard, and then secondly the long fight to earn Grazier, Fasson and Brown recognition. They are complementary stories, and are intwerwoven in the order of which Shanahan and his team uncovered the stories and embarked on their campaign. There are some small errors of accuracy, but you can feel Shanahan’s passion. Something that many historians would do well to take note of, and not those involved in the making of U-571. A fine statue was commissioned and erected in Tamworth town square, and a nearby Hotel was named the Colin Grazier Hotel. A Tamworth Housing Estate has had its roads named after men involved in the incident. And every year, the people of Tamworth celebrate Colin Grazier Day, with a small ceremony at the memorial, and a tot of rum in the evening. This is a book and a campaign that is gripping and most inspiring. If only more local newspapers and local councils would be more diligent in recognising our communities heroes. It has certainly motivated me to ensure that Portsmouth’s heroes of the two world wars should never be forgotten. I’ve been working through the list of names on the Portsmouth First World War Memorial. Although there are a few names that have eluded me, thanks to the Commonwealth War Graves Commission and the Portsmouth edition of the national roll, it has been possible to find out a lot about many of the men from Portsmouth who fell in the Great War. The national roll in particular is a great reference source. It’s not comprehensive, as families had to pay for their relatives to be included, and it also covers men who survived as well as men who died. It tells us when a man joined the armed forces. The exact word used is important – men who were already in the Army were serving soldiers, men who joined in the euphoria on the outbreak of war volunteered, men in the Territorial Force or Army Reserve were mobilised, and men who were conscripted are described as ‘joined’. The entry supplied by the family gives us details that we would not get from anywhere else. In some cases we are told when the person went to the Western Front. We find out when and where somebody was wounded. In some cases, we also hear about how somebody was killed. Its also interesting to note how many men died of illness. In particular, towards the end of the war quite a few men died during the Influenza pandemic. In general however it seems that a lot less servicemen died on the home front or away from the front-line than did during the Second World War. Private W.E. Morey, of the 6th Battalion of the West Yorkshire Regiment, came from 18 Vivash Road. He had volunteered in October 1915. He was taken prisoner on the Somme, and somehow was killed by the Germans in an internment camp at Langensatz – on 27 November 1918, 16 days AFTER the armistice. Private P. O’Neill volunteered in August 1914. Although he never served overseas, he did serve at home with the Royal Army Medical Corps. He was invalided out of the Army in August 1915, and died in Landport Hospital in January 1916. He is not recorded on the Commonwealth War Graves Commissions register, as he was not a serving soldier when he died. Pioneer James Newman was one of the oldest Portsmouth servicemen. Of 70 Unicorn Street, Portsea, he was serving in the Army when the war started. Initially serving with no. 2 Stores Section of the Royal Engineers, he was sent to France in December 1918 after the Armistice to work with the Graves Registration Unit. He was accidentally drowned in the Sambre Canal on 13 December 1919, and is buried in Les Baraques Cemetery, France. He was 63. Sergeant A.A. Martin was a pre-war regular soldier. Serving with the 2nd Battalion of the Hampshire Regiment, he was wounded at Gallipoli. He was seconded to a Bombing School at Lyndhurst in the New Forest, to train new recruits in how to use Grenades. He was killed in an accident on 23 February 1917, and is buried in Lyndhurst. He came from 64 Bedford Street, Buckland. Private C. Oakey was also killed accidentally. From 70 Union Street, Portsea, he originally volunteered in October 1914 and joined the Royal Army Medical Corps. He was wounded at Ypres, and was again wounded after being transferred to the Salonika Front in 1917. After the armistice he was transferred to Turkey, and was killed in an accident. He is buried in Haidar Pasha Cemetery in Istanbul. The Battle of Passchendaele had begun on 31 Jul7 1917. The first phase during July and August had failed to make any serious progress. The Battle of Broodseinde was to be the last assault launched in the Ypres Salient as part of the offensive, and was an attempt to protect the southern Flank of the salient. The ever-elusive breakthrough was still hoped for, however. After arriving at Proven on 20 September, the 1st Battalion of the Hampshire Regiment spent the next week training hard. It was hard to get much training done, however, due to the limited amount of space available. On 23 September a draft of 103 men arrived, and on the 27th the Divisional Commander, Major-General Matheson, inspected the Battalion. On 28 September the Battalion entrained at Proven in the afternoon, and detrained at Elverindghe. From there the Hampshires marched to Roussol Camp. The next day Company Commanders instructed their NCO’s and men in the plans for the forthcoming offensive. The day after that on the 30th each Company rehearsed their plan for the attack. later on the 30th the Battalion went into Brigade reserve at the Canal Bank, relieving the 2nd Lancashire Fusiliers. The detailed operation order issued by the Adjutant listed the equipment and rations that the men were to carry. Officers were not to carry swagger sticks, and were to dress exactly the same as the men. Haversacks and entrenching tools would be left behind. Instead every man was issued with either a pick or shovel. Each platoon would carry 10 wire cutters, every man 2 aeroplane flares and every man 3 sandbags. A detailed map was issued, showing the ground over which the Brigade was to advance. Starting in the area of Langemarck, the 11th Brigade was to attack on a narrow front, capturing ground to the North East of Poelcappelle. The 1st Hampshires were on the left, the Somerset Light Infantry on the right, and the 1st East Lancs in support and the Rifle Brigade in reserve. The Hampshires objectives, in order, were to be the Red House, Beek Villa, Imbros House, Kangaroo Huts and Tragique Farm. The principal objective, however, was merely a green line marked on the map. An even more detailed Battalion-level map was issued, that showed each of the Companies objectives, and also the distances between each landmark on the map. A diagram of how the platoons were to be set out in the advance was also included, and each platoon was allocated a specific objective, either to capture or, for the support companies, to consolidate once it had been captured. The attack was to be on a 2 Company front, with each company’s front being 150 yards wide. The two other companies were to be in close support. A creeping Artillery Barrage was planned, as well as a Machine Gun Barrage. 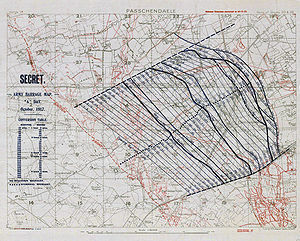 A detailed map showed the planned creep of the Barrage, beginning at Zero hour, and creeping forward on lines in front of the advance, moving forward every 2 to 3 minutes. Each Battalion was also alloted 2 Vickers Machine Guns to act in support. 2 Platoons were also designated as counter-attacking platoons, and designated authority to act on their own initiative to break up any German attacks. A Lewis Gun team of the 21st West Yorks was to be attached for anti-aircraft duties. A contact aeroplane was to overfly the area at set times to observe and report on progress. On 1 and 2 October officers and NCO’s went forward to reconnoitre the line. The next day, on the 3rd, the Battalion went forward to its assembly area at Eagle Trench. It comprised 19 officers and 522 men. 3 officers and 118 men were to be left with the transport, to form a nucleus for reforming the Battalion if it were wiped out. Two tins of hot tea laced with rum were brought up for each Platoon. Heavy rain had fallen in the first few days of October, turning the artillery-riddled ground into a morass. The Battle on 4 October inflicted heavy casualties on the Battalion. 4 officers and 36 men were killed, and 8 officers and 182 men were wounded. 25 men were missing. Among the wounded were Colonel Armitage and Captain Laurie, the Chaplain, who both remained at their post. Four Portsmouth men were killed on 4 October 1917. Private William McCarthy, 32 and from Highland Street, Eastney, is remembered on the Tyne Cot Memorial. 19 year old 2nd Lieutenant Henry Hall, of Victoria Road South, Southsea, is also remembered on the Tyne Cot Memorial. Private Charles McCable is another man remembered on the Tyne Cot Memorial, while Private Frank Oxford, 29, is buried in Cement House Cemetery.